I've had such a lovely time at your whimsical party! Thank you for letting me drop by. Please come over to my place for some more partying! Yum yum, your party looks wonderful. 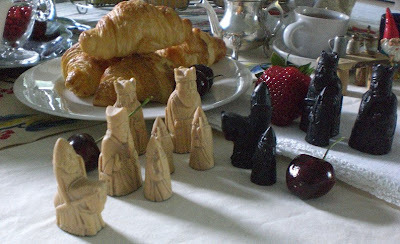 I had a sweet and delicious time at your tea party...and very much enjoyed the miniature tea set--clever chessmen and cherries. Fun! What a pretty and delicious tea party you have made! 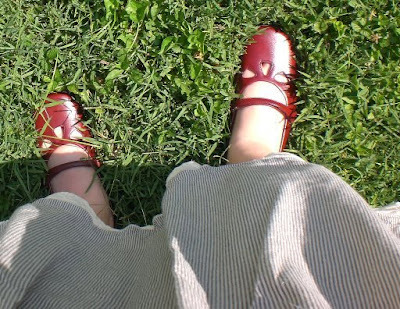 Loved your party...we both started ours with shoes...yours really looks like a party. 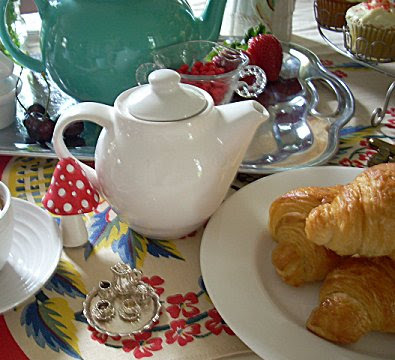 You're madly invited to my tea party, feel free to stop by anytime! Have a great weekend, that silhouette is beautiful! *munch, munch, munch...* Thank you very much for the cookies. And the mango tea. I enjoyed watching the chess kings and their cherry-rolling-game. What a lovely tea party indeed! I hope you'll stop by my place for some refreshments too, I'm off to the next party for another sugar overload...What fun! This looks like sooooo much fun, count me in! Love your silhouettes! Your tea treats are soo delish! 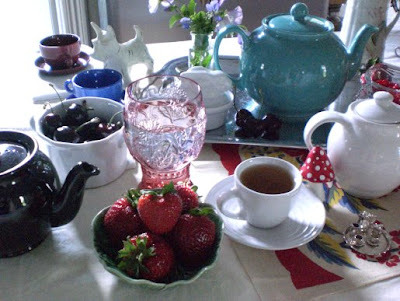 What a lovely whimsy tea table too! Great photos!! Your spread looks quite yummy!! What a lovely tea party! Thanks for sharing, and I'd love to enter your drawing. so many goodies to choose from, how wonderful your table looks I don't know where to start. Thanks for having me, please do stop by my party. What a lovely party...and how nice of the nights to show up, and the gnome to be so sweet...thank you for your invitation and I invite you to mine as well...see you soon! Such fun and Alice would be proud...great goodies too!!! Oh to eat all of them and not gain an ounce! That would be magic!!! Come visit my pups for tea! Happy Mad Tea Party Day! What a wonderful dream filled with cookies and cream ;-) and chessmen all in a row. Awesome party. The food was great and I had a lovely time. I loved it when the chessmen came out. Those rogues! oh what fun! love that tiny teaset! Fantastic! I love your Alice´s book! I hope you in my party too! I had a splendid time at your tea party! I'm trying to hold myself back because it's going to be a long day filled with many treats. Stop by my place for something sweet. Enjoy! What a scrumptious tea party! You were so lucky to attend! We didn't get any sweets at my tea party...pout. Have fun! My mouth is watering for the lemon cupcakes with fruit flavored sugar sprinkled on top! Yummy! QUOTE: "and the Black Knight was very sure that it was their turn." Great party and you've officially made me have a craving for cherries. What fabulous treats are laid out on your table for me to sample. Thank you! I think I will!! Your silhouette is wonderful!! Greetings from another mad hatter!!! The food looks divine, and the silhouette is amazing! A beautiful Alice, all grown up! Feel free to stop by my teaparty (wildatheartart)as well, if you haven't already! Have a great day! A feast for the eyes! ~ I enjoyed every minute of my visit. I didn't make any special treats because I just knew I would find yummy ones throughout the whole day. It was so fun stopping by. See you are the party for tea! Darling!! I'd love to win!! Beautiful and so inviting! Just love your tiny little silver tea set. Had a wonderful time......so little time for so much eye candy! Lovely tea party. I love the chess pieces! Oh me oh my...I am literally drooling over your sweets right now! And that gnome is a sweet treat in himself ;-) Lovely tale...please visit our little adventure if you get a chance too...what a fun day! And that silhouette is lovely, thanks for the chance! 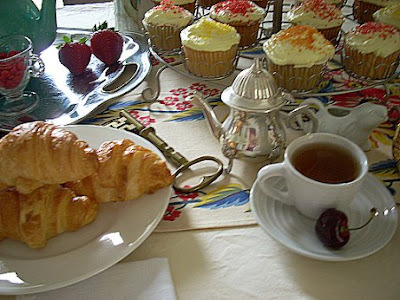 Wonderful Tea Party.....I loved it. Have a wonderful day. This was so cute...I really enjoyed your party...let's do it again sometime! Simply beautiful, but all this food on everyone's sites is making me hungry! what an adorable teapot! and i just love those cupcakes --- flavored sugar is always a party hit! i would love for you to drop by my tea party to say hello! What a fun party! I lcve silhouettes so my fingers are crossed! I really need a cupcake now! wow! 51 partyers visited your party before me. i am obviously getting a very late start... i loved your party! now i am hungry for MORE party fare... thank you for the lovely time! What magical photos. You sure know who to set the mood for a great party! I love your blog and your cupcakes make my mouth water. I absolutely love the large book too. A simply grand tea! I'm mad for all your treats. Do make your way to the cottage where the party continues!!! 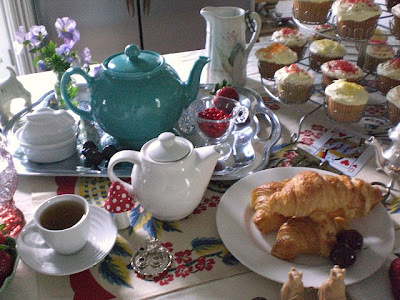 What a pretty and delicious tea party !!! 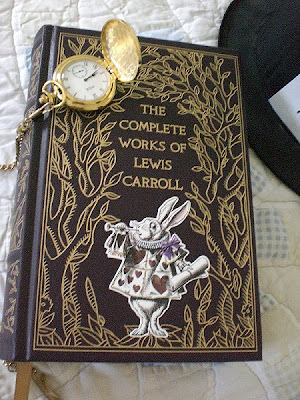 I love your Alice´s book! What a lovely tea party. I wish my chess pieces would come to life. Oh the stories they could tell. What a delightful array of goodies! I would have a difficult time deciding which treat to sample first! LOVE your shop goodies too! lovely party, and a sweet silhouette. Your party was so fun! Thank you for a lovely time, those cupcakes were positively scrumptious! P.S. I'm having a giveaway at my party, come visit if you have the time! What a lovely party! :) Thanks for having me. Oh my first stop and I'm already plump...the goodies were great! O! Your strawberries reminded me I forgot to get my strawberries out!!! Yes, I would LOVE to win! I see YOU had a lil cat at your party too!! Everything LOOKS scrumptious!! Come by mine too! mmmmmmm. YUMMY! Now I am really sweet crazy- just a nibble or two if you please. But where to start! so many goodies on your table! just a nibble? you won't even know it's gone... maybe. HAve a delightful day! What a lovely party! If you noticed that the dormouse has been missing it is because he is sitting in my left pocket. Beautiful! First time I have visited your blog so I'll be back! 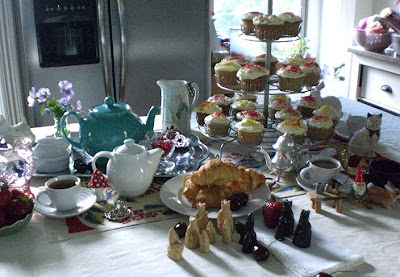 A wonderful tea party filled with sweet treats and tea. Mmmm loved the party but can hardly move now as I have eaten TOO MANY CAKES! Lovely silhouette too. Beautiful party!!! I had fresh strawberries at mine too!!! I love your tea pots! Wow, that is an impressive assortment of sweets!! please stop by mine you can! Just scrumptous! I love all the frosted cupcakes!!! An adorable post, thank you for having me! Come visit my party too, if you like! 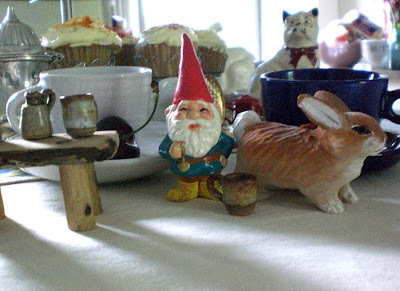 What a cute little tea set (and gnome!) and your art is so charming, perfect! I "love" that miniature tea set, it's just the most delightful thing ever. 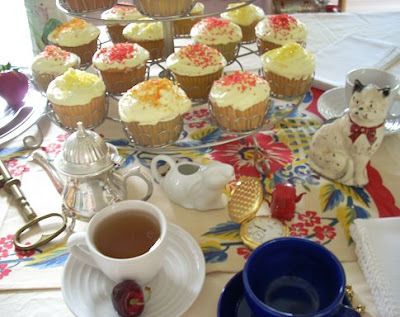 What a lovely post, I very much enjoyed my visit, I love the table setting, the cupcakes look fabulous! Thanks for inviting me to your tea! I enjoyed all the flavored cupcakes. Oh, and the berries were nice too. Such fun having the chessmen there too! and i do love your shoes!! My first visit and I loved it! The pictures are perfect! The tea was lovely and so were the sweets. Thank you for inviting me over for such a fine treat! Lovely tea party! Your tiny tea set is adorable. 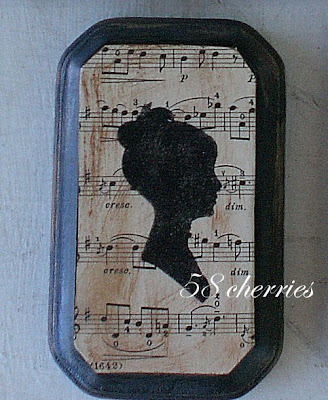 Fantastic tea party, and I would love to win your silhouette.Have a great weekend. Those cherries and cupcakes look delicious... where do you get fruit flavored sugar? Lovely party! Very nice. 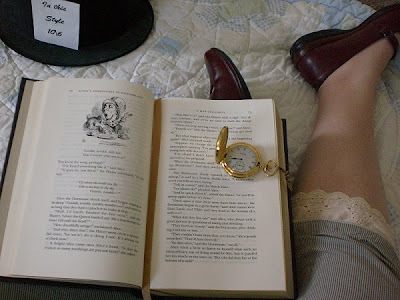 Just the "Alice" I picture with the lace petticoat, the perfect shoes, and the book and pocket watch. Lovely! We had fun at my party too. I love your story and your photographs are incredible. Everything looks so delicious too. 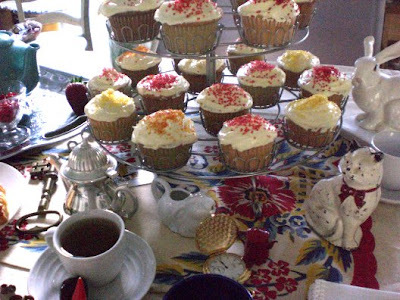 A totally enchanting Mad Hatter Tea Party. Your party was divine! I loved the cherry roll and the chessmen. My boyfriend peeked over and said he really liked the white teapot- short and stout! I'm so glad to have found your blog! I'll be back soon :) I can't wait to see who the winner of the silhouette is! mmmmmm yummm...i wonder who the tiny tea set was for???? very yummy looking indeed and really fun time visiting. Gorgeous party. Thank you for a delightful time. Off to visit the other guests..the white rabbit and I~late as ever! Heloooo Doll!! You have outdone yourself! How spectacular you Tea Party Spread is!! I would love a croissant!! Your images are wnderful, you have outdone yourself! Thank you for being such a true part of WOnderland!! I promise to come back! Delightful! wishing you wonderFULL wanderings throughout the Mad Hatter weekend! Oh, and those cakes and strawberries look divine.....might I trouble you for just one? Hi, I have enjoyed your Tea Party. Thanks for inviting me to your tea party! Those cupcakes look delish! GREAT party! Thanks for having me! Lovely and delicious Tea...and a story one never tires of. I had a lovely time. I have the kettle on and lots of tread should you like to stop by...you will be most welcome. I loved your party. Great little gnome!! Love your party! That spread looks delicious, and I love your photos. Really pretty table and look at those treats! Love cupcakes. Thanks for a sweet party. What a lovely tea party! 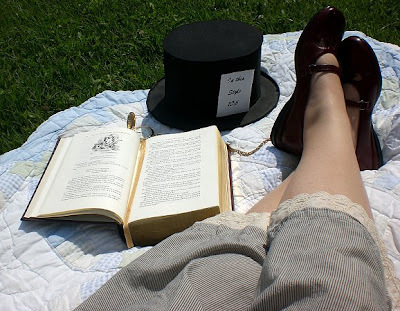 I loved seeing your pictures of the book as you sat down to read and fell asleep to dream....Great blog!